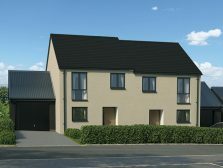 Mazzard View is a collection of 77 freehold homes with 2, 3, 4 or 5 bedrooms, located in the popular village of Landkey. The village, although fairly small, has all of the local amenities and services for young and old, including an excellent primary school, a locally-run store and Post Office. 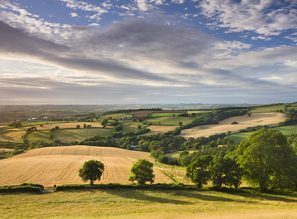 Surrounded by stunning North Devon countryside and 3 miles from Barnstaple, Mazzard View provides a great opportunity to purchase one of the new houses in a highly sought after area in the South West. Our development takes its name from the area’s famous Mazzard trees, a type of wild cherry discovered by local farmers in the early 1800s, and rescued from the brink of extinction through the Countryside Agency’s ‘Millennium Green’ project in 2000, situated just below Mazzard View. Mazzard View is conveniently situated on a quiet road within easy reach of the main A361 North Devon Link Road. Our new street is called HARFORD WAY, EX32 0FG. Houses for sale in Barnstaple are also a good choice for those looking to commute to the nearby city of Exeter, which is just over an hour away by car or train. 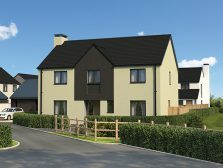 Our collection of traditionally-built houses for sale near Barnstaple features 9 house styles for everyone from first time buyers to growing families or downsizers, each designed with a modern twist to reflect the local architectural character. Stunning barn-like garages, sharp render with coloured reveals and all have views which include the local hill tops and countryside. 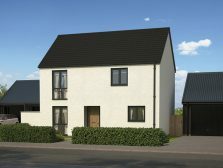 Do come and visit our stylish 4 bedroom detached SHOW HOME and a 3 bedroom VIEW HOME which are both open from Thursday to Monday inclusive. 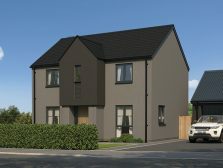 We currently have a selection of 3, 4 and 5 bedrooms homes for sale, and HELP TO BUY is available for both FIRST and SECOND time buyers. House to sell? 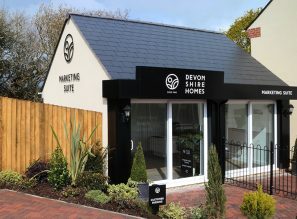 Do ask about our DEVONSHIRE MOVE SCHEME too! Landkey is a popular village with around 2000 residents, enjoying all the facilities a thriving community needs, including a well-regarded country pub, a 15th Century church, a day nursery and a village store with Post Office. The primary school is rated by Ofsted as ‘Outstanding’. In addition, Portmore Golf Park lies on the outskirts of the village. Barnstaple, North Devon’s principal town is less than 3 miles away. As well as being the area’s main employment centre, it is also the premier destination for shopping, eating out and culture. Highlights include the Queen’s Theatre and historic Pannier Market.